The concert portrays the extraordinary role of Hanuman the monkey warrior-god and his monkey army in the ancient Indian epic, ‘Ramayana’. They assist Prince Rama in his mission to destroy the evil ten-headed demon Ravana and rescue his kidnapped wife Sita. 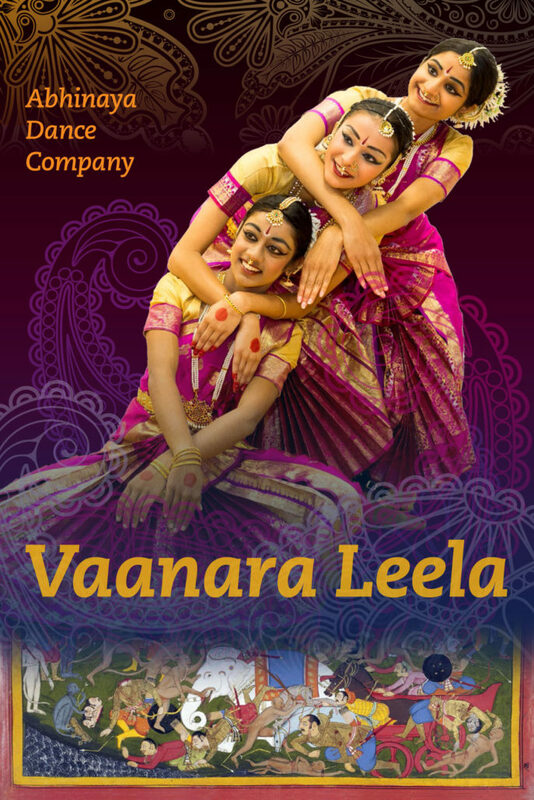 Abhinaya Dance Company of San Jose, the dance company that brought “Arjuna – A Warrior’s Tale” to life in 2014 to critical acclaim now presents “Vaanara Leela – Monkeys in the Ramayana“. The Ramayana is one of the two major Sanskrit epics from Hindu mythology describing Prince Rama’s journey. The most extraordinary feature in this epic is the role played by the monkeys in the forest where the prince is exiled. Prince Rama seeks the help of Hanuman, the monkey warrior venerated as a god, and Sugreeva, king of a vast monkey army to find his abducted wife, Sita. Focusing on the story from the monkeys’ perspective, Abhinaya Dance Company’s production will dramatically portray the hordes of monkeys and their enthusiasm and energy as they set out to find Sita. When Hanuman succeeds in finding Sita in Lanka, he and the monkeys assist in building an incredible bridge of stones spanning the ocean to reach Lanka. “Vaanara Leela – Monkeys in the Ramayana” premiers on November 12th and 13th with over 15 dancers and new choreography, promising to be another of Abhinaya’s exciting new creations. The performance is directed by Artistic Directors Mythili Kumar and Rasika Kumar. The key role of Hanumān will be danced by Rasika Kumar (Associate Artistic Director & Choreographer). The performance features new choreography by Mythili Kumar, Rasika Kumar, Malavika Kumar and Anjana Dasu and will be performed by the dancers of Abhinaya Dance Company of San Jose to music composed by veteran composer Asha Ramesh and recorded by master musicians.